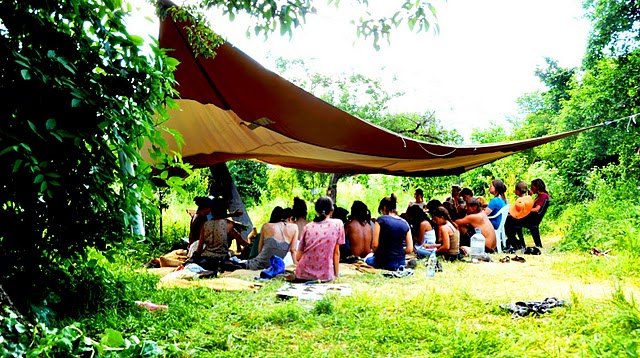 After teaming up on a successful spring season course in 2010, a 4-day Introduction to Permaculture workshop, Permaship and TreeYo decided to take it to the next level with putting on a PDC in June 2011. It also marked Doug and Sara’s first full course together as lead teachers and brought TreeYo into its next fruition. With 30 students graduating from all over Eastern and Western Europe, North America and even Asia, it was diverse group that formed a wonderful community for two weeks full of fun, learning, and cultural exchange. We also managed to further the Permaship sites with some fun and exciting hands-on action. One of my favorite features of Permaship is the diversity within such a small space ( small scale intensive at its finest, stacking functions). Often times PDC’s are held at extensive farmscapes but we managed to have a healthy sized group in this village setting. Shipka so eloquently displays what village-scale PC could be like as they are on their way with so many people participating in food production and the beginnings of a local economy. Bringing Shipka back to its glory is one of Permaship’s efforts as well as other local businesses and politicians. It was a place of 10,000 at one time and with the mass exodus of people to the city, the succession pattern of settlements is not taking place. The youth leave, disassociate with village life, yet don’t realize their wealth that is inherent in this context. 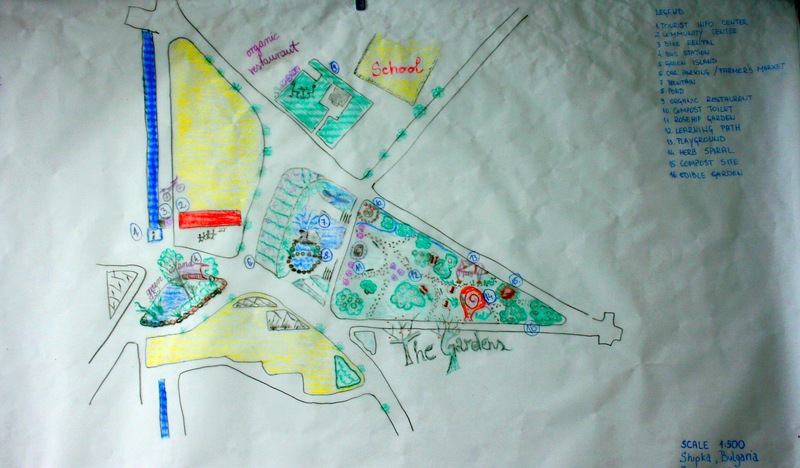 Fortunately, two of the groups in their design projects focused on this exact thing with redesigning the village center. Their designs were delivered before the mayor of the city and also one other local business man who seeks to make even stronger ties with Permaship because of similar philosophies. Getting tourist to stay longer and featuring the local areas natural beauty and abundance were common themes. The designs featured such dazzling display features as the most enthralling bus stop ever, an indoor/outdoor market stall, and a cob bench island around the towering willow tree that protrudes from the river and concrete. The mayor was responsive and with the proper funding and continuation of the design revision it is quite possible for this to happen. Part of the beauty of the course is that it forms a community web so the genius of the whole group can manifest its fruition. The Permaship crew is sure to get support from several of the students so that the project can move forward. The others designs focused on other local businesses outside of the Shipka but in the plains of Balkan Mountains. One was Dimo’s worm farm, Leave no Waste, which is a partner in Organics with Permaship. He produces worm castings and sells worms and this material for clients throughout Bulgaria. It’s a great addition to a country who needs organic inputs for it’s growing position as an exporter of food and member of the E.U. The soil has been farmed mostly organic for thousands of years and stimulating the biology once again is paramount as it the chemical model and extensive monoculture creeps in. So two groups took on making the site more energy efficient through altering the flows while making the site a bit more holistically driven. 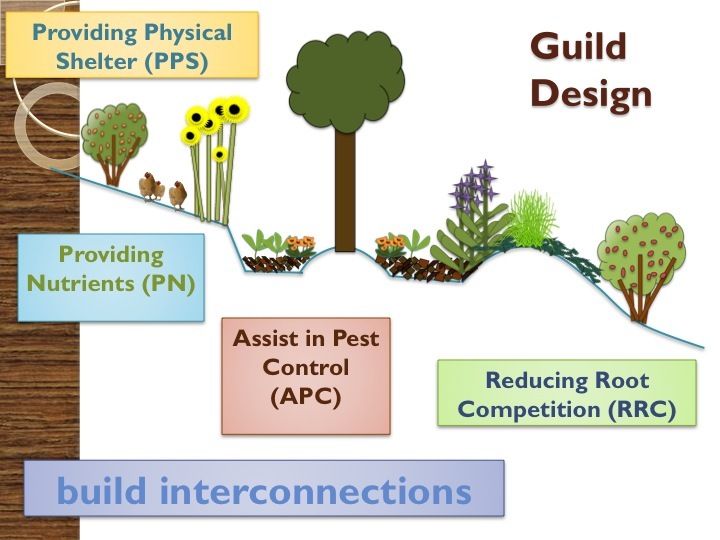 This came in the form of more food production happening, social space incorporation, beautification, and energy being cycled even more thoroughly. 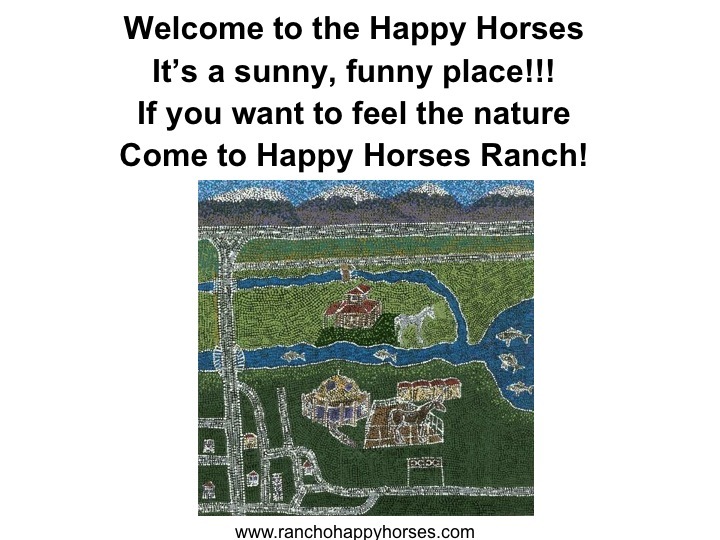 Also another two groups took on redesigning a piece of property dubbed the Happy Horse Farm. Pasture rotation, accentuation of the adventure/eco-tourism business, zone 0 and 1 development, as well as extensive food forest were lined up. 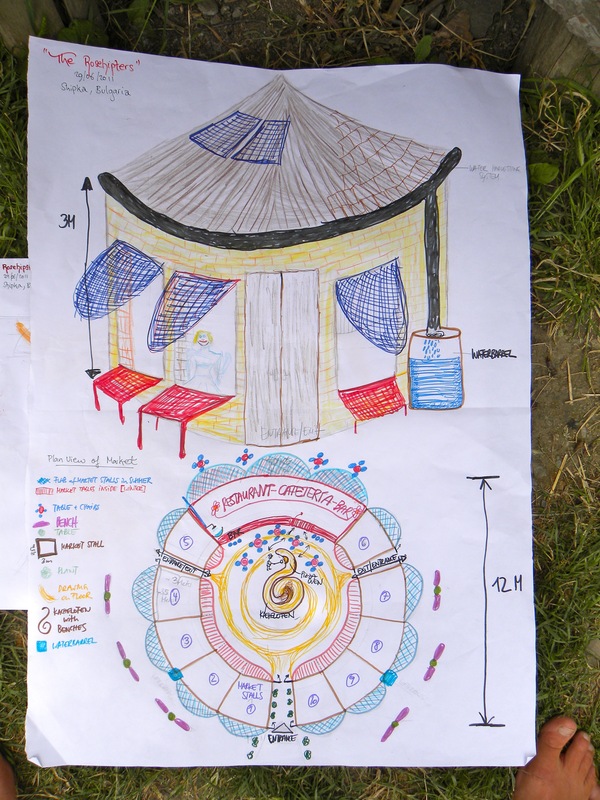 It was a big site and while unplanned, the two separate groups managed to focus on different aspects which when the two were put together created a very holistic design. We also managed to take advantage of various nooks and crannies on the site for our classroom space. We had several outdoor spaces, several indoor spaces, and everything in between for the interactive and lecture style learnings. This echoed in the talent show that even featured origami in the kitchen, singing in the bathroom, a human pyramid on the lawn of the edible horseshoe, traditional dance in the nursery area, and magic tricks, comedy routines, and singing in the back room. This course was a lot of fun and this was a talent show to remember. Another night to remember was the night of the summer solstice. 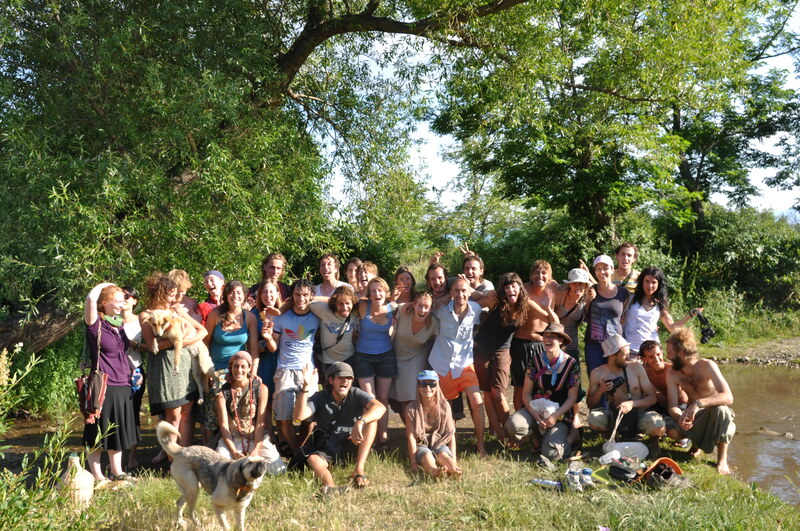 After a day of class a group of us walked to the spring to gather some water for what was to be a fantastic evening. There we made crowns of flowers and were lead by Ilze as her traditions in Latvia had trained her in this sort of thing. We picked and weaved the flowers in this ultra surreal setting on the day marking the abundance of the future summer season. There we were, a small group of us picking flowers near were water pours effortlessly out of the earth. Weaving to display nature’s bounty and diversity, its colors and patterns, it smells and textures, what a treat it was. Once the crowns were complete and dinner was eaten, we shared in circles and danced around fire. Some even got the idea to jump fire and even to walk on its coals. Needless to say, it was a night of laughter, song, story, and stars to mark the evening of length. 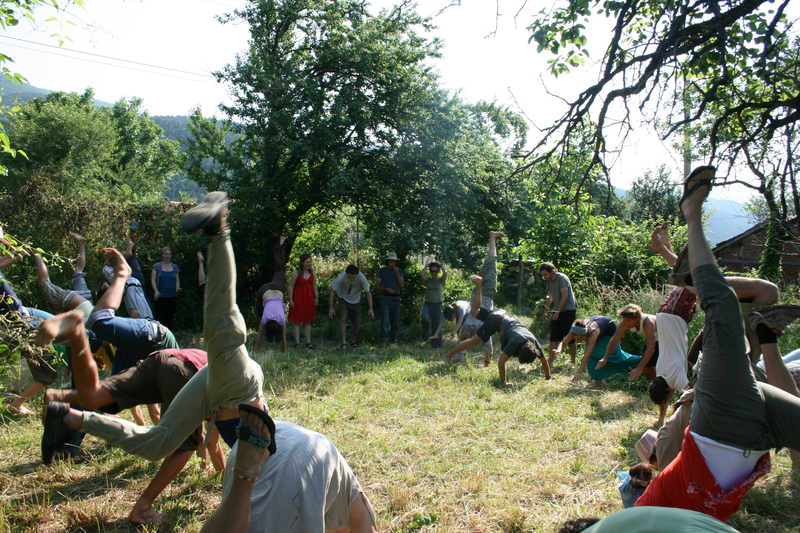 This course, with the help of Sara and Mihail Kossev, our filmmaker and comic relief stand-in, was filled with games and interactive exercises to get the blood flowing and loosen people up. We managed to do some silly ones and ones that left a lasting impression like the bacteria and protozoa. I mean really who will forget Felix changing from a meek bacteria with a high-pitched meep, to the monstrous bass-toned terror of a protozoa he quickly transformed into. This is part of the philosophy that Nick of Permaship echoes quite often, “learn through the body”. And we did that with charades to review principles and hands on to integrate concepts like natural building, composting, and swale building. Students always love getting dirty with cob, digging and seeing water flow, and feeling the heat from the compost a couple of days later. Observing this afterwards is an important part of the learning process. Overall the course was heaps of fun and spurred our interest in working in eastern Europe further including teaming up with Permaship further. 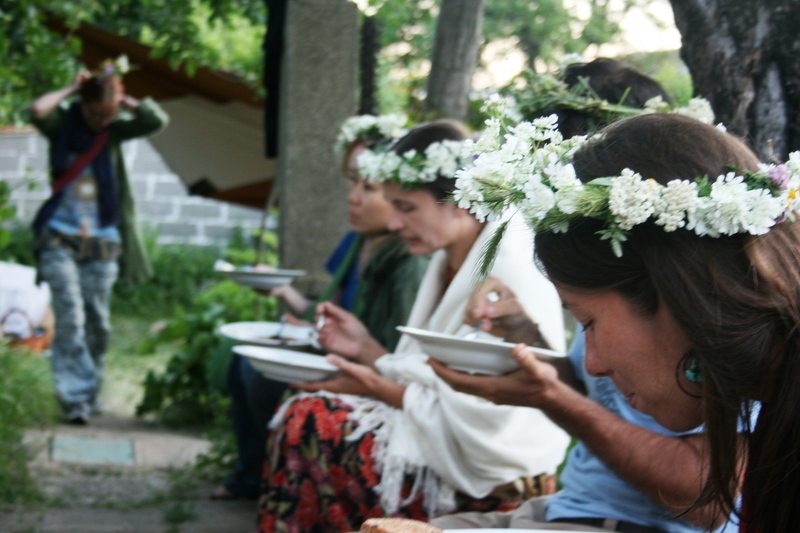 We hope to offer another PDC as well as an internship of some kind next year to help bring soil fertility back to the fields and gardens in an around Shipka. Thanks so much to the Permaship crew and to all the students who made this such a wonderful course to be a apart of. Cheerio!!!!!!! I had the pleasure of having a PDC with Doug and spending some weeks with Sara. Now that they teamed up can only mean one thing! This PDC will be with no doubt -a big succes. Enjoy all the knowledge that they share and the person that those 2 are, for everybody that will come. 325 Euros WTF!!! Very interesting course, but Very expensive! Sure it is cheaper. But what is the main goal reaching as many people as possible (and therefore spreading this knowledge) or organice this as a “job”? People that look for look prices could find cheaper courses in Africa. May someone pay the course by colaborating with the stuff? 800-900 USD for the same course. I taught there once and we charged a fifth of that. My courses are committed to staying cheap, trust me, please. For bulgarian people is very expensive. Did you know…for many BG people 650 BGN is one salary!!! THIS IS EXPENSIVE FOR BG!!! Yes, it’s should be affordable for locals. But the euro price is ok.
Great initiative, all the best!